Crisp, clean sails not only look better than dirty, worn out sails, they also work better and let your sailboat heel less. New sails are expensive so it’s smart to take care of the ones you have so that they will last longer before you need to replace them. Here are some simple things that you can avoid doing and that will help your sails to last longer. I’ll also mention a few things that you should make into habits that can prolong the life of your sails. There’s an old catchphrase about a horse having been “ridden hard and put away wet.” It applies to sails too. Damp sailcloth makes an inviting environment for mildew, which can be almost impossible to eradicate completely. Laminate sails are especially vulnerable if moisture gets between the layers. 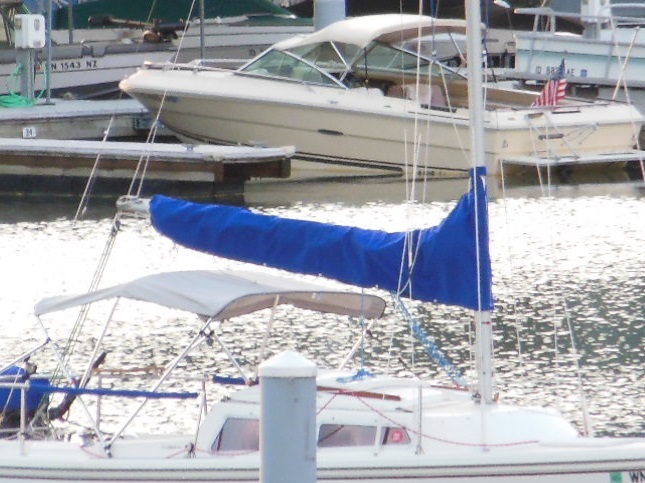 Nylon spinnakers and other flying sails aren’t exempt either, as their colors can bleed if stored wet. To avoid starting your own mildew farm, dry your sails thoroughly before your store them, even for short periods of time but especially during the off season. However, don’t hoist a wet sail to dry while flapping in the wind or you’ll do worse damage as I’ll explain in a moment. 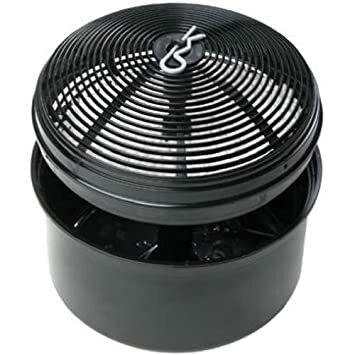 If you live in a region with high humidity, store them in the driest space you can with good ventilation. Inexpensive chemical dehumidifiers can be surprisingly effective at extracting moisture from the air. 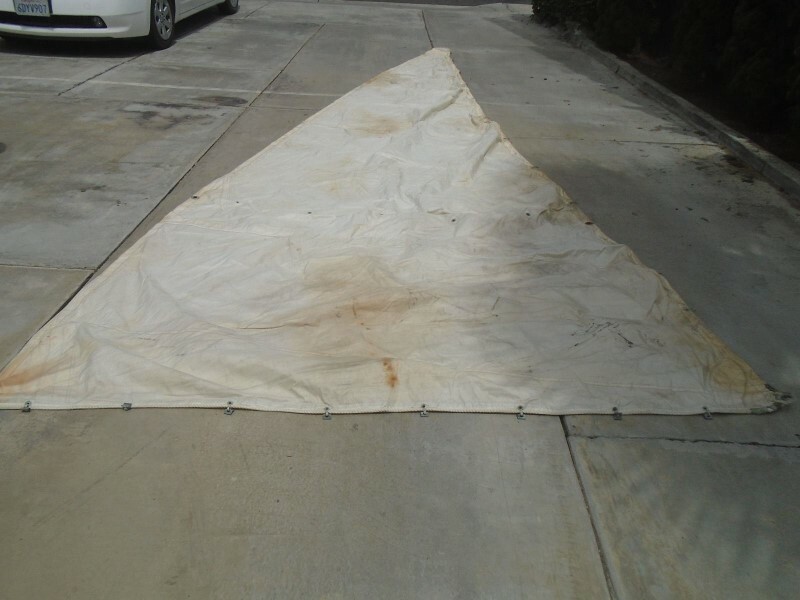 The biggest cause of death of a Dacron sail is the breaking down of the fibers in the sailcloth. Instead of resisting stretching (called its modulus), the sailcloth yields to the force of the wind and the sail becomes “blown out.” It loses the ideal shape it had when new and becomes baggy. This makes the sail less efficient and increases heel. You’ll struggle to keep the sailboat upright and it won’t go as fast as it should. A couple of bad habits speed up this breakdown. One is excessively folding the sail, which I’ll describe in a moment. The other is letting the sail flog in the wind. Flogging happens when the sailboat is pointed head to wind in a strong breeze. The same can happen when you motor-sail and let the sails flog. When a sail ripples violently, its fibers loosen a little. Every time the sail flogs, they loosen more and there’s nothing you can do to tighten them up again. A good rule of thumb to remember is, if a sail is making noise, it’s being damaged. If you’re my age, you remember clotheslines. Hardly anybody uses them anymore. Do you remember the feel of line-dried laundry? If it wasn’t also flogged by the wind, it was stiffer. Nowadays, we use clothes dryers to flog our laundry and dryer sheets to make it soft and fluffy. When you flog your sails, they get soft and fluffy too. Avoid hoisting your sails in an area with the strongest winds. Bear off the wind or lower your sails to avoid flogging whenever you can. Adjust leech lines to prevent fluttering edges. If your sails don’t have leech lines, you can easily add them yourself. See Improve Sail Shape and Performance with a Leech Line. If you have a headsail furler, don’t reef it under high loads, and ease the luff tension between outings. The easy way is to Upgrade Your Rig With a DIY Adjustable Backstay. Know how to reef and secure your mainsail quickly. I describe one way in Single Line Jiffy Reefing Made Easy. Dacron sails are very white. Even though they’re made from synthetic fibers, they stain easily and when they do, it’s impossible to get some stains out. Stains can be a problem if you ever want to sell your sailboat or just the sails. 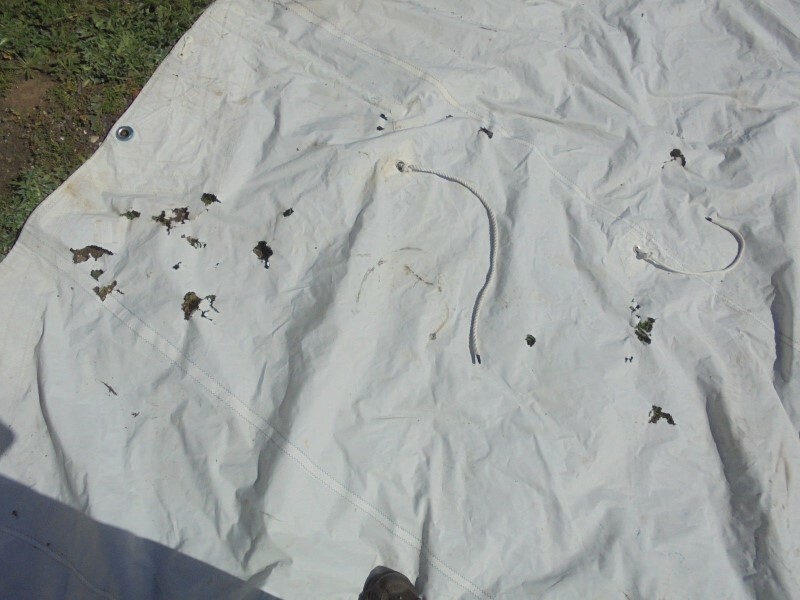 I shop for used sails online and stains are an obvious tip-off that a sail hasn’t been well taken care of. I don’t give stained sails so much as a second look. Mildew. If it sets in despite your best efforts to keep your sails dry, you can minimize it by cleaning them properly as I describe in How to Clean Sails at Home. Just don’t use bleach. It’s okay for cotton but it damages the stitches that hold your sail together. That goes for chlorinated swimming pools too. Stick with mild, non-caustic cleansers. Rust. Don’t let your anchor and chain get rusty. Unless you have a furler, your headsail will be on the foredeck when you’re handling your ground tackle and sooner or later, it will touch a sail. The stain will be there forever. For help fighting rust, see How to Maintain an Anchor and Rode and How to Restore Rusted Parts. Bird droppings and bug excrement. These can be very acidic. Cover your sails whenever there’s a good chance that birds will roost on your masthead or windex. Clean away insect excrement as soon as possible and don’t let it set in. To sew your own sail covers, see How to Make a Mainsail Cover and No Furler? Make a Foredeck Sail Bag. Blood. Stuff happens. When it does, keep blood away from your sails. Wash and bandage right away. Some stainless steel polishes. They might make your pulpit bright and shiny but some will leave gray residue anywhere it comes into contact with your headsail. After you’re done polishing, wash parts with soapy water to remove the residue. Even if you don’t have any noticeable stains, it’s a good idea to occasionally rinse your sails with fresh water even if you sail in fresh water. Besides preventing light soiling, this helps remove dust and debris that provide fertilizer for mildew. Into their sail bags, that is. This one is a longstanding debate among sailors. Some claim that neatly flaking or rolling a sail makes repetitive creases in it. They claim that randomly stuffing the sail prevents permanent creases. I agree about avoiding repetitive creases but there are better ways than random stuffing, which will make your sails about as smooth and aerodynamic as crumpled aluminum foil. The one exception is nylon spinnakers. Do stuff them loosely into their bags. 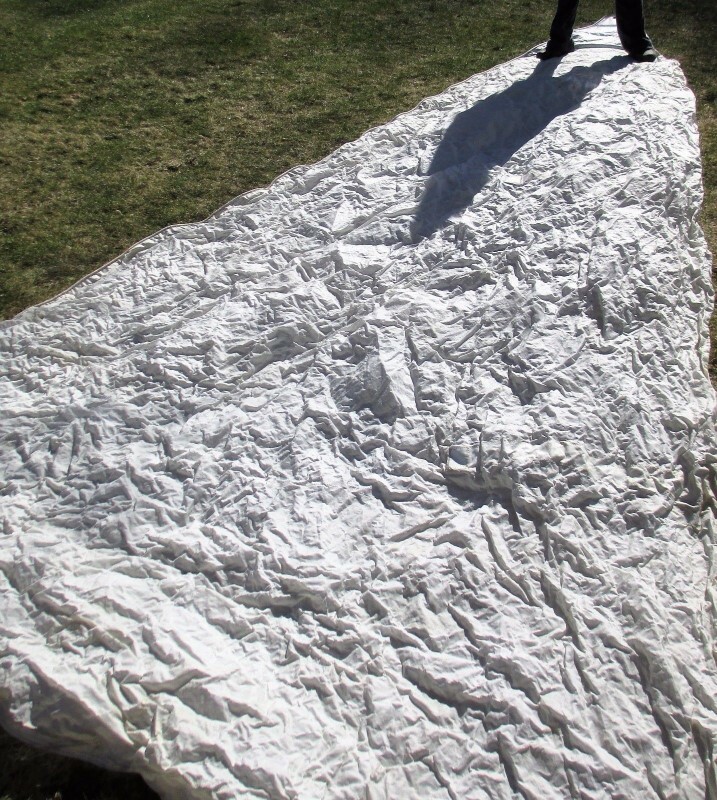 The best method of all is to neatly roll the sail up like a scroll across its width. This leaves no creases. Alternatively, neatly flake the sail on top of the boom with the battens parallel to the boom to prevent bends. In between outings, loosely secure a rolled or flaked mainsail to the boom with sail ties. If you have the space, store your sails below deck this way too. Sausage tube sail bags are available for this purpose. It’s also best for long term storage but remove the battens first. This is how the pros take care of their sails. If you don’t have that much storage space or for less than crisp sails, flake the sail on the ground and then loosely roll the stack from one end to the other. Each time you do this, flake the sail a little differently and it won’t develop permanent creases. This method takes the least storage space, half the volume of a sail bag in most cases. Here’s a video from our friends at Sailrite that demonstrates the best ways to fold different types of sails. 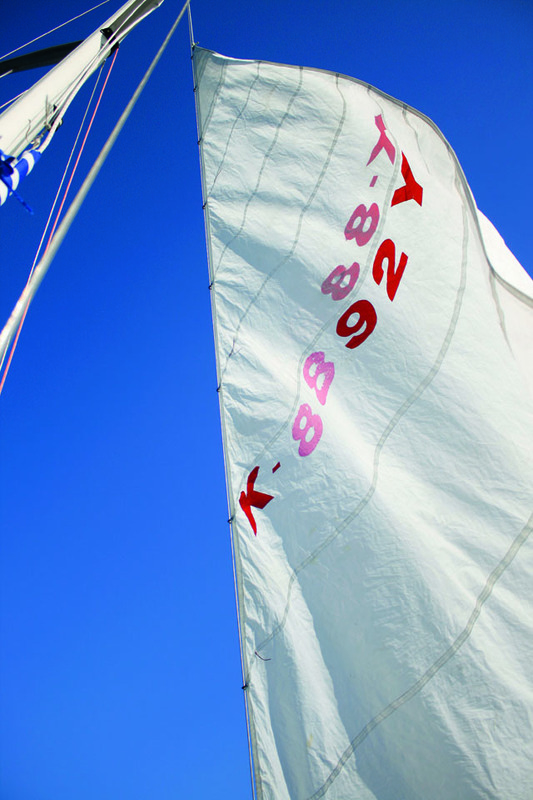 One of the fastest ways to damage a sail is by letting it rub against part of the of your sailboat or its rigging. In most cases, the rubbing is repetitive and happens over and over, wearing against the same spot on the sail until it wears completely through. Headsails close hauled against the spreader tips. Apply preventitive patches at these points or have your sailmaker add them. Headsails rubbing across shrouds when changing tacks. Install sail rollers on the shrouds to prevent chafing. These can be as simple as cheap, thin wall PVC pipe. Tape over all cotter pins and sharp hardware edges. Mainsails rubbing against spreaders when running downwind on a beam reach. Tape over all cotter pins and sharp hardware edges on the spreaders and sheet the mainsail in slightly to prevent chafing. In the sun, that is. Even though Dacron is relatively UV resistant, it can still be damaged if its exposed enough. All it takes is for the thread in one seam to weaken and your sail could unexpectedly split wide open some day. This is why roller-furled headsails have sacrificial UV covers along the leech and foot. It’s also the biggest reason to use a mainsail cover. Basically, anytime your sails won’t be used for more than a few hours, cover them. Canvas sail covers don’t have to be expensive. 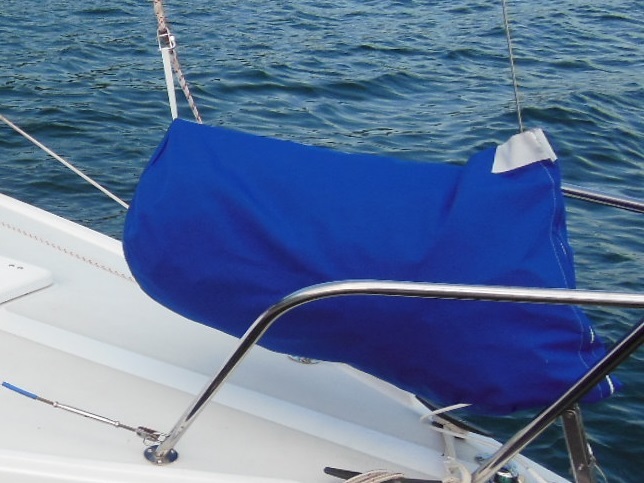 To sew your own , see How to Make a Mainsail Cover and No Furler? Make a Foredeck Sail Bag. Protect your investment in sails and they will thank you with long life and better performance. If your sails are at the end of their life and you’re ready to replace them, see Product Review: Rolly Tasker Sails for a good value option. I’ve used so much of $tingy’s advice. I made the really large foresail bag and the sail cover. Mine look as good as my harbormates’ custom high $ jobs but as I used every bit of the material that Sailrite sent, mine are larger and go on/off more easily! Fork over 20 bucks and buy his ebook! You too can make all sorts of great canvas “boat jewelry” for way less than market, eh?